The Giant Schnauzer is a separate breed from the Miniature and Standard. Their country of origin is Germany. Breeds were developed for specific work in the 1600's; this breed was developed to be used as drovers of sheep and cattle and as a guard dog. Its coat was also influenced by weather and living conditions. 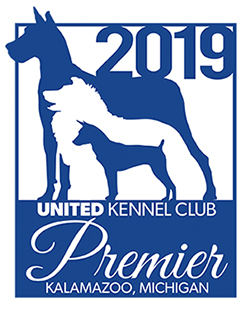 Some of the breeds which were used in the development were the Standard Schnauzer, Great Dane, rough haired sheep dogs and possibly the Bouvier des Flandres. The breed was not that well known until World War I when it was used for police training. 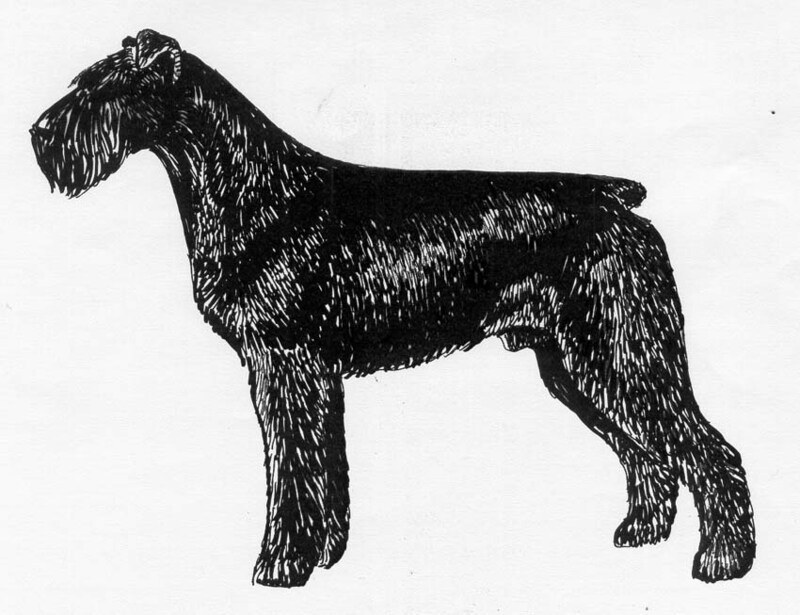 The Giant Schnauzer was recognized by the United Kennel Club in 1948. The Giant Schnauzer is a larger more powerful version of the smaller Standard Schnauzer. The breed is square in proportion, with the length from the point of shoulder to the point of buttocks equal to the height at the withers. He is ruggedly built with a dense, weather-resistant coat that is black or salt and pepper in color. The Giant Schnauzer is good natured, even tempered and very loyal to his family. His intelligence, trainability, strength, endurance and natural resistance to disease make him ideally suited to be a companion, utility and working dog. The head is long and rectangular. Measured from the tip of the nose to the occiput, its length is equal to half the length of the topline from the withers to the set on of the tail. Long, strong and flat, without a protruding occiput. The topline of the skull lies in a parallel plane to the topline of the muzzle. The stop appears well-defined due to the eyebrows. Muzzle is long and deep, ending in a blunt wedge. The bridge of the nose is straight. The lips are black, smooth and tight-fitting. A full complement of strong, white teeth meet in a scissors bite. The upper and lower jaws are powerful and well formed, but the cheeks must not interfere with the rectangular shape of the head. Medium size and oval in shape, placed to look straight forward. Eye color is dark and the expression is lively. Eyelids are close fitting. Eyebrows slightly shade the eyes. When uncropped, the ears are V-shaped, drop ears of medium length and thickness. Set high and carried with the inner edge close to the cheeks. The fold should not be above the top of the skull. When cropped, they are identical in shape and length to uncropped ears, but with pointed tips. They are in balance with the head and not exaggerated in length. The nose is large, full and black. Well arched and strong, of moderate length; blending cleanly into the shoulders and with skin fitting tight at the throat; in harmony with the dog's build and weight. The shoulder blades lie close against the ribcage and are well-muscled. They are long and sloping, laid back at an angle of approximately 50 degrees to the horizontal. The upper arms lie close to the body and form an angle with the shoulder blade of 95 to 105 degrees. Forelegs are straight and vertical when viewed from all sides with strong, slightly sloping pasterns and good bone. The elbows are set close to the body and point directly backwards. The withers form the highest point of the topline, which slopes slightly downward from the withers. The chest is moderately broad, and the ribs are oval in shape. The forechest is distinctly marked by the prosternum. The back is short, strong and taut to a short, strong, deep loin. The croup is slightly rounded, imperceptibly blending into the set on of the tail. The underline is well curved to the flank, which is not too tucked up. In balance with the forequarters and strongly muscled. HIND LEGS Upper thighs are moderately long and broad, with strong muscling. The lower thigh is long, strong and sinewy. Hocks are very well angulated and firm. Rear pasterns are short and vertical. Well arched, compact and catlike; turning neither in nor out; with thick, tough pads and dark nails. Dewclaws, if any, on hind legs should be removed; on the front legs, may be removed. The tail is set moderately high. Docked to the second or third joint, or natural. If natural, a sickle or saber carriage is preferred. Wiry, hard and dense, with good undercoat and a not too short outer coat that lies close to the body. The outer coat is rough and long enough to be checked for texture. Hair on the legs tends to be less coarse. The hair is short on the forehead and the ears. Typical characteristics are the beard (which should not be too soft) and the eyebrows which slightly shade the eyes. Pure black (with black undercoat), or salt and pepper. In salt and pepper, the shades from dark iron gray to silver gray are all permitted, but there must be a dark mask to emphasize expression. Distinct light markings on the head, chest and legs are undesirable. Height at the withers is 23½ inches to 27½ inches for males and females. Weight is approximately 75 to 100 pounds. Free, agile and ground-covering, showing flexibility and elegance. The action is somewhat springy and the back remains firm.